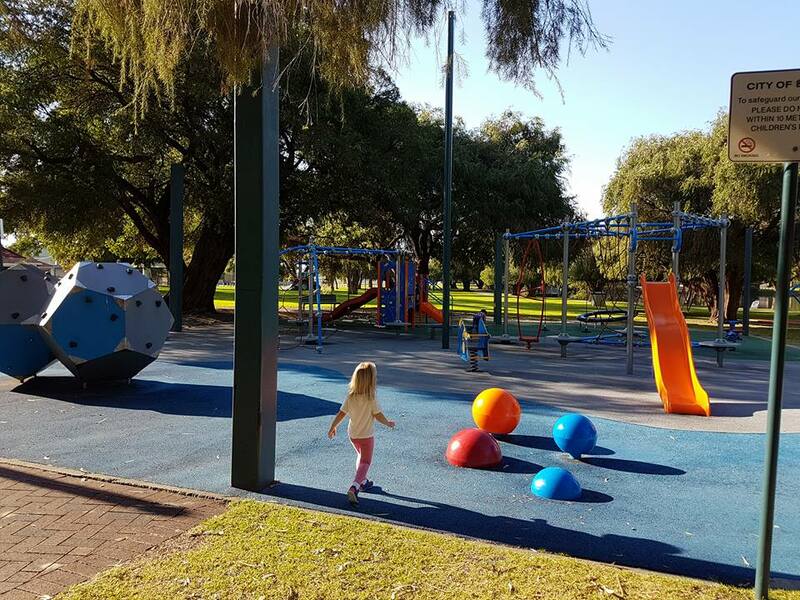 One of our favourite playgrounds nearby is Tomato Lake in Kewdale. 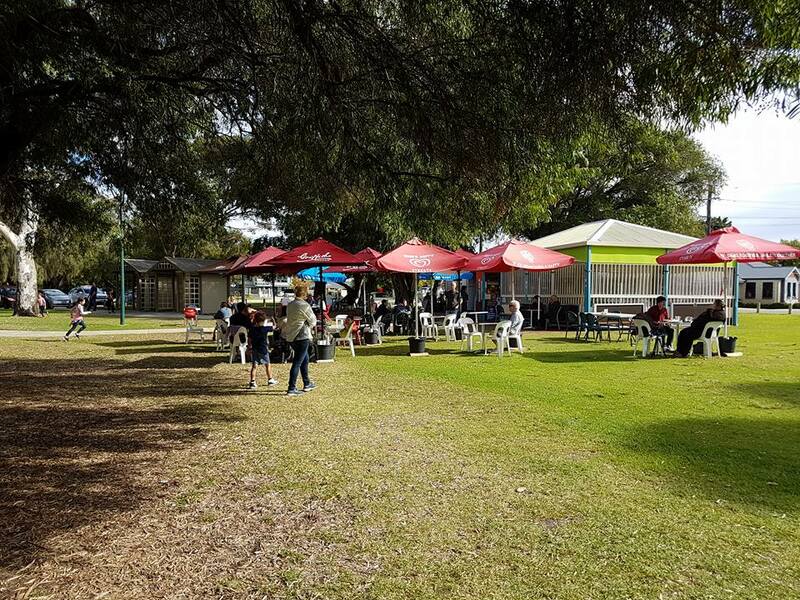 It’s a great space with a range of equipment to suit all ages, bbqs, picnic tables and a walkway all round the lake suitable for walking, scooters or bikes. 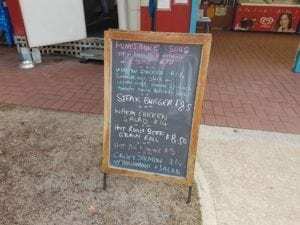 There is even a cafe open Wednesday to Sunday if you prefer to buy coffee, snacks or lunch. 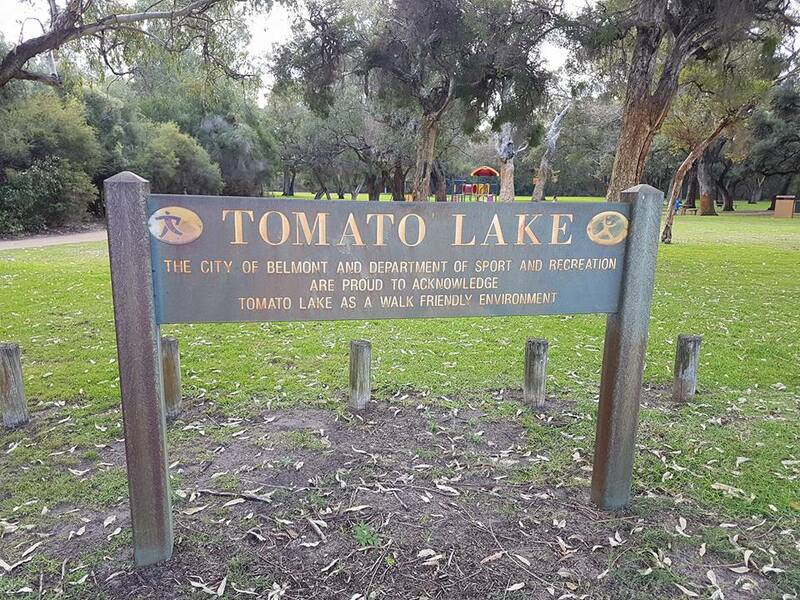 The main entrance to Tomato Lake is from Oats St and you will find plenty of free parking. 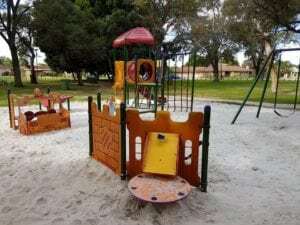 This is also where you will find the main playground which has equipment that suits toddlers through to older children. This playground is on softfall base and has shade sails in summer. There are a few picnic benches on the edges of the playground so you can sit and supervise. 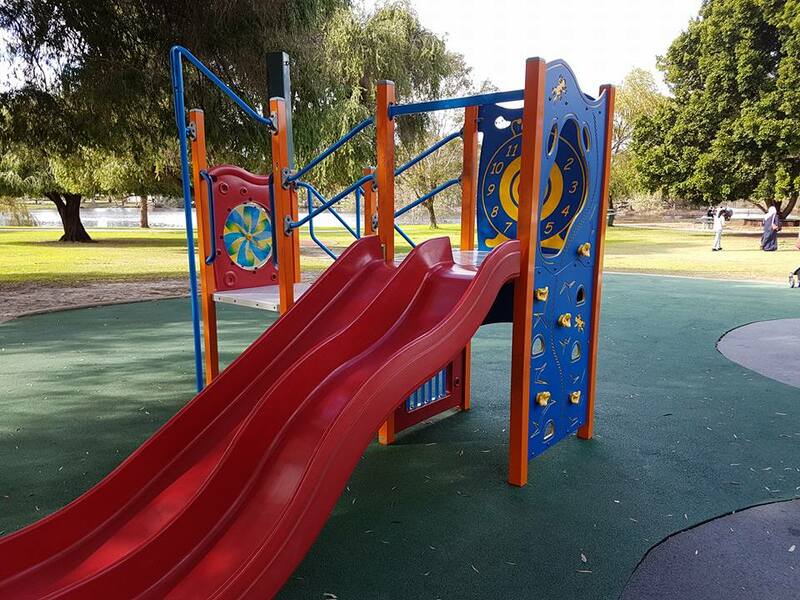 The toddler equipment is a smaller playframe with slides, walkways, small climbing wall, fireman’s pole and steps. Miss 3 has been playing on this since she could walk and still enjoys it. 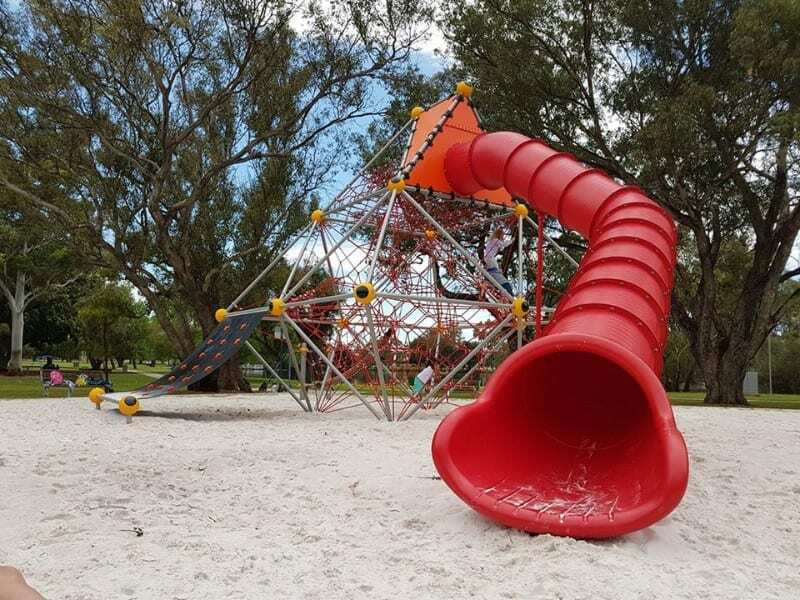 It has a double slide which is good if you go with a friend or siblings. 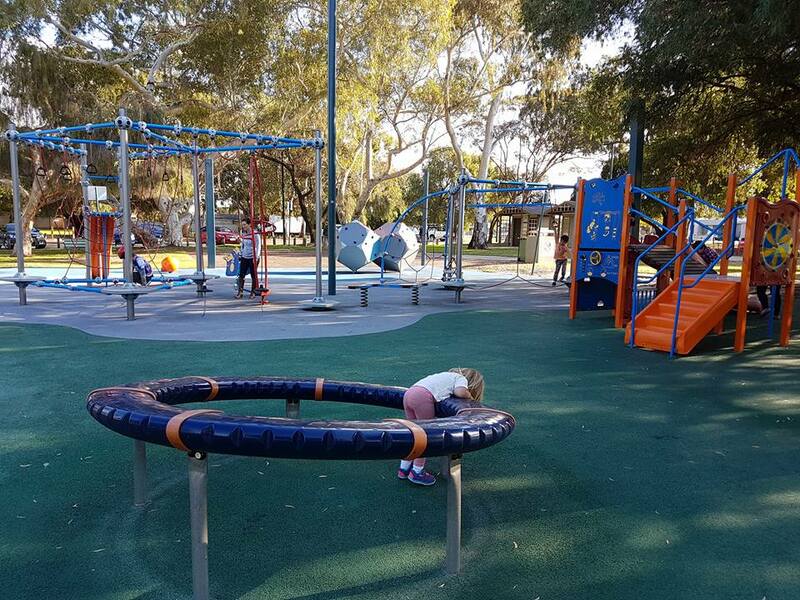 There is also a bouncy see saw and bouncy sit in animal in this main area which is also popular with the younger children. There is a spinning wheel which kids of all ages seem to love. 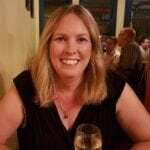 It’s on an angle and spins around, depending on the age of the kids they can have fun doing it themselves or a parent may need to push gently. Miss 3 always enjoys this one. 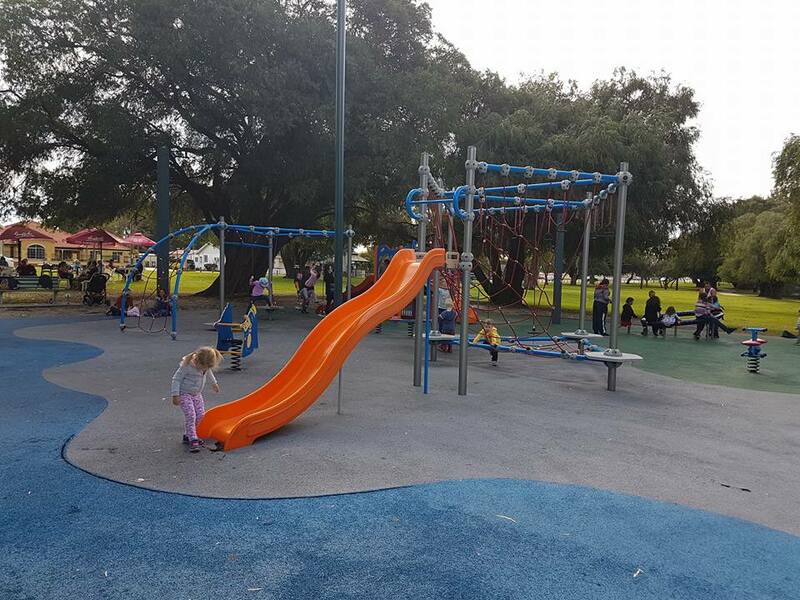 Also in this main playground is lots for older children. 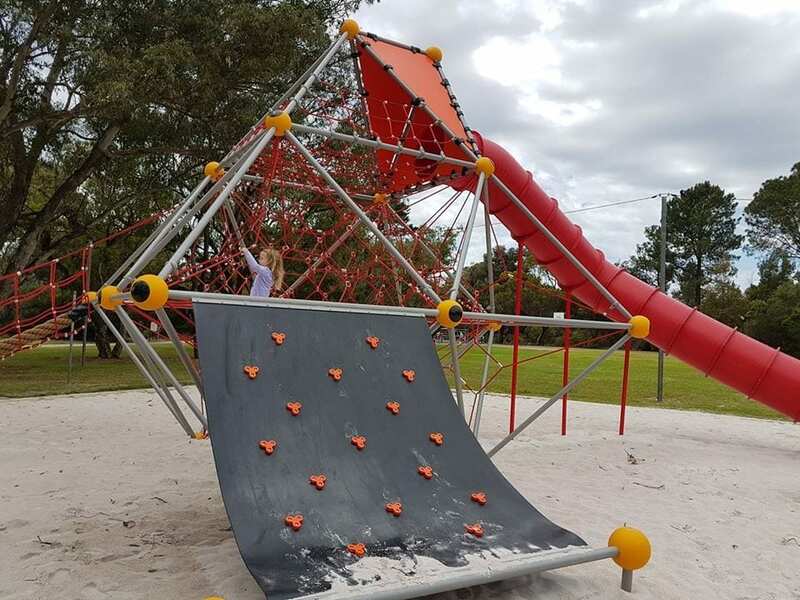 This includes lots of climbing type equipment, monkey bars, balancing equipment and a larger slide which is accessed by climbing up the rope frame. There is also a birds nest swing on softfall base in this area. 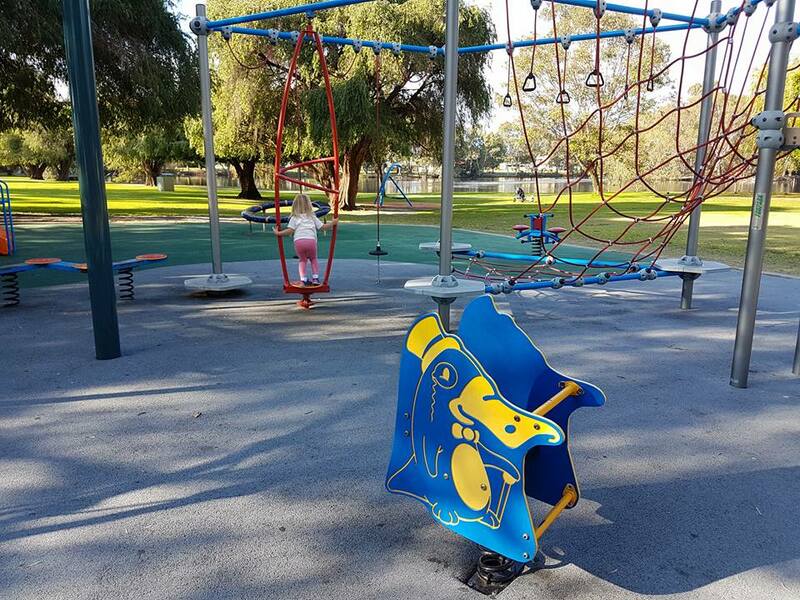 The Tomato Lake kiosk and toilets are located adjacent to this playground. There is also lots of open grass space all around the reserve which makes it great for running around, ball games or a picnic. The cafe is open Wednesday to Sunday 9am to 4pm. It does on public holidays but usually closes over the Christmas period. Also be aware it is cash only. 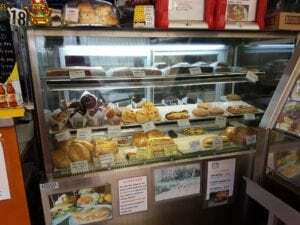 It has offers coffee, cakes, ice cream, sandwiches, hot chips and has a special board of more substantial meals. They have some seating inside and lots of seating outside under the trees or umbrellas. 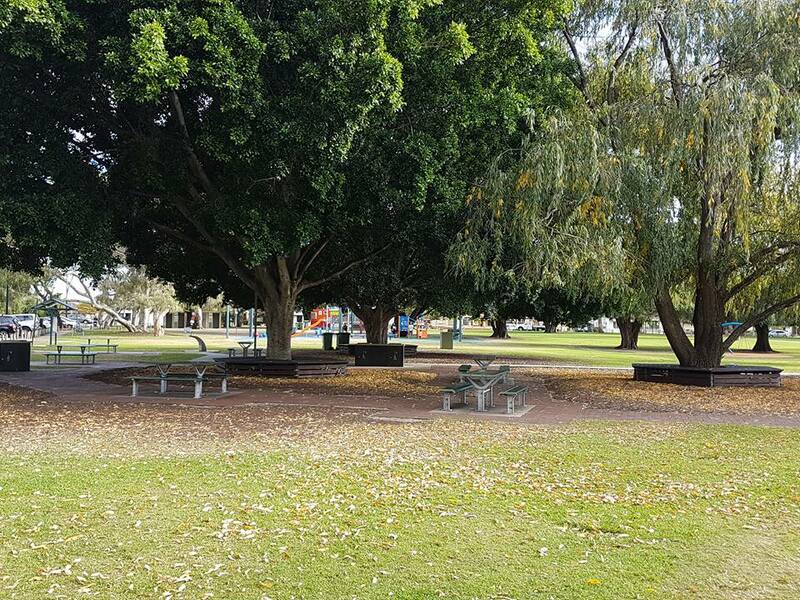 Close to the main playground are a number of picnic tables and BBQs under lovely big trees. These areas do get popular on weekends and are often used for birthday parties. 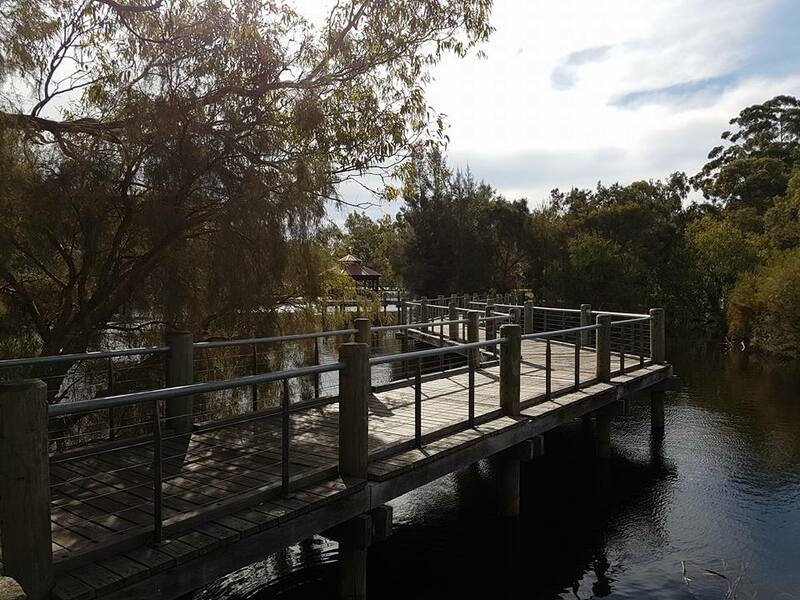 There is a 1.6km walkway all around the lake. 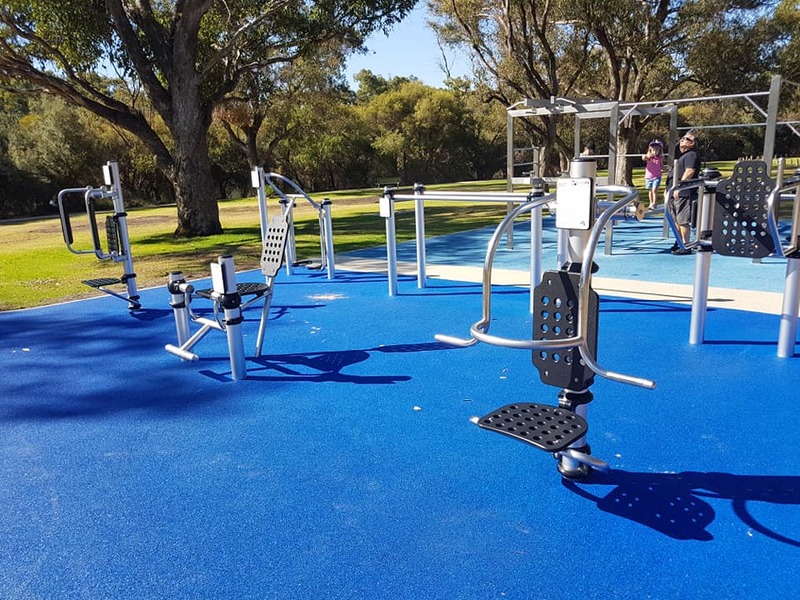 If you do walk around you will find other play areas and exercise equipment. The pathway is suitable for bikes and scooters but be aware it is also popular place to walk dogs and with people exercising. 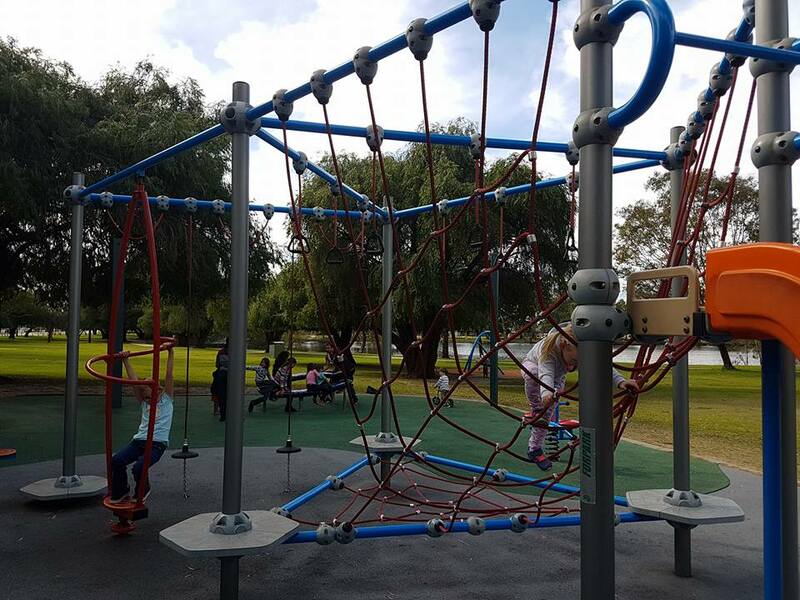 Not far from the main playground is a set of swings and a Spiderman climbing frame. Both of these are sand based. 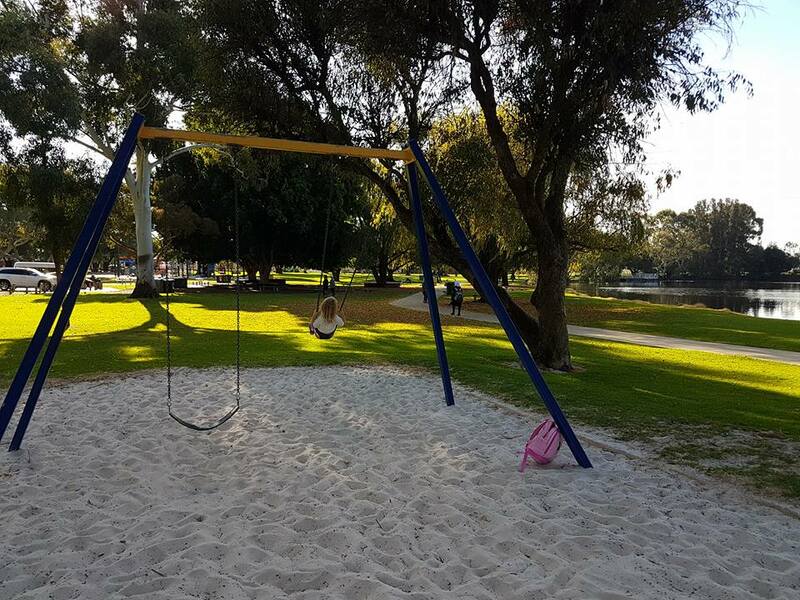 The swings have a toddler and standard swing. 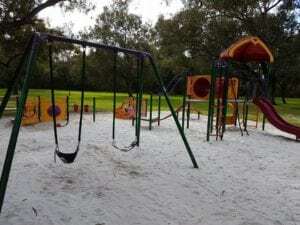 The swings and climbing frame are under tree shade only. 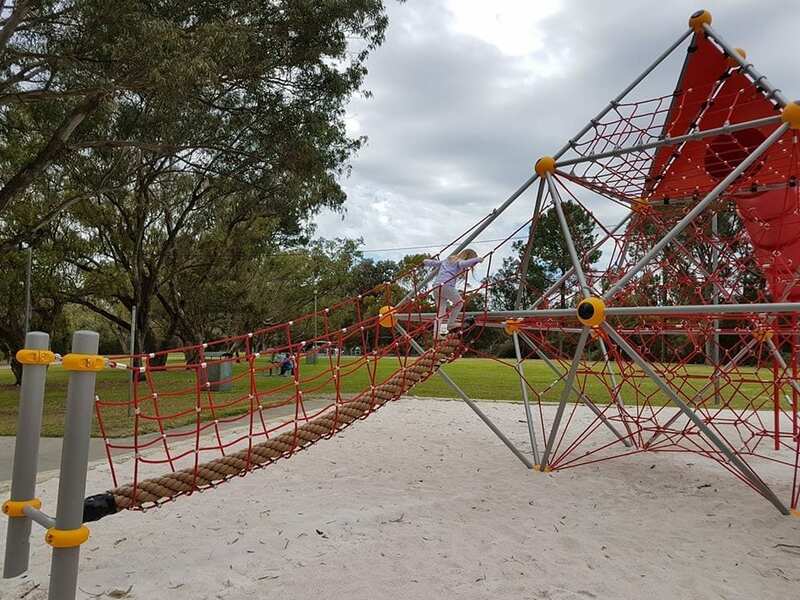 The climbing frame playground has an rope bridge to climb up to the main climbing frame or there is a climbing wall which also leads to the main frame. After making your way through the climbing frame you can reach the slide. The kids loved the slide, which by all accounts was “fast”! 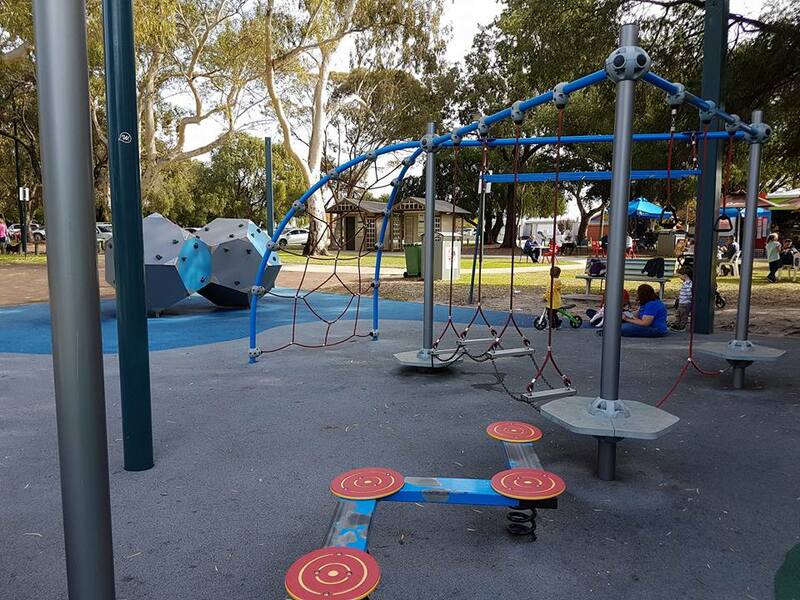 This playground is suited older children as some aspects were difficult for younger children. The younger kids we were with enjoyed playing on the climbing wall, trying to reach the top and then sliding back down again. Close to these is some exercise equipment and a basketball hoop. Around the other side of the lake from the main playground is another smaller playground and picnic, BBQ area. There is a carpark this side that is accessed from President St. This playground is sand based and generally quieter than the main one. 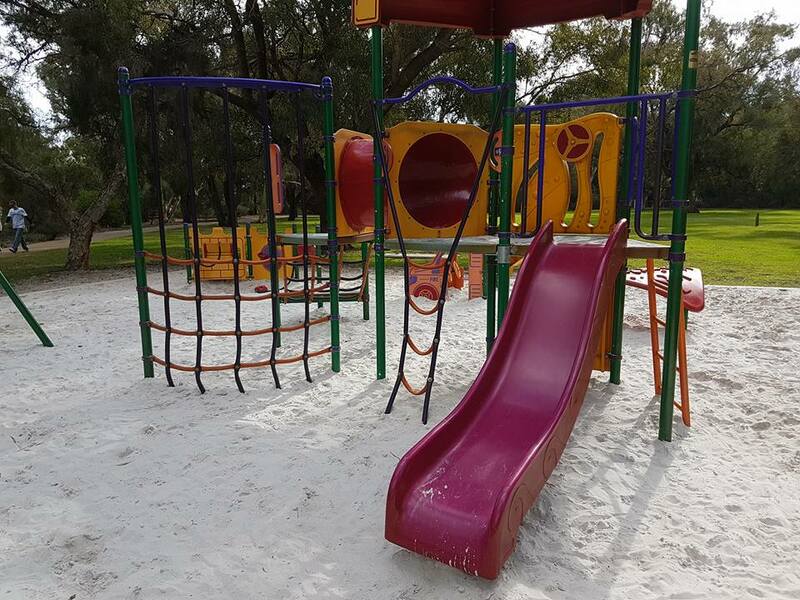 It has a playframe with slide, tunnel, climbing, swings (toddler and normal), and some sand play equipment. 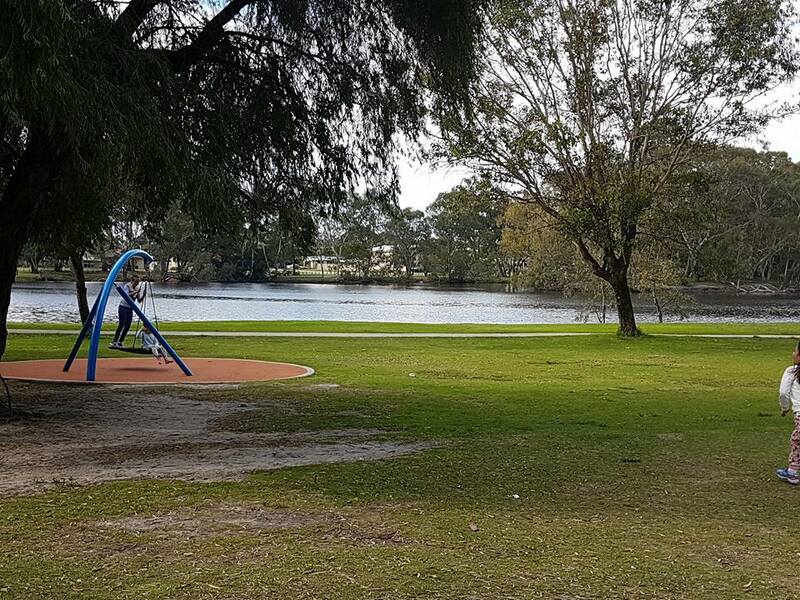 Miss 3 likes this playground and always wants to stop and play when we are walking or scooting around the lake. There is a bench seat on the edge of the playground. Close to this playground is picnic tables and BBQ. There is also a large grassed area for ball games or picnic. There are also toilets on this side of the lake. Part way round the lake walk there is a walkway and gazebo overlooking the lake. Good shortcut of little legs are getting tired. Offers a nice view of the lake and is a good place to view birds from. 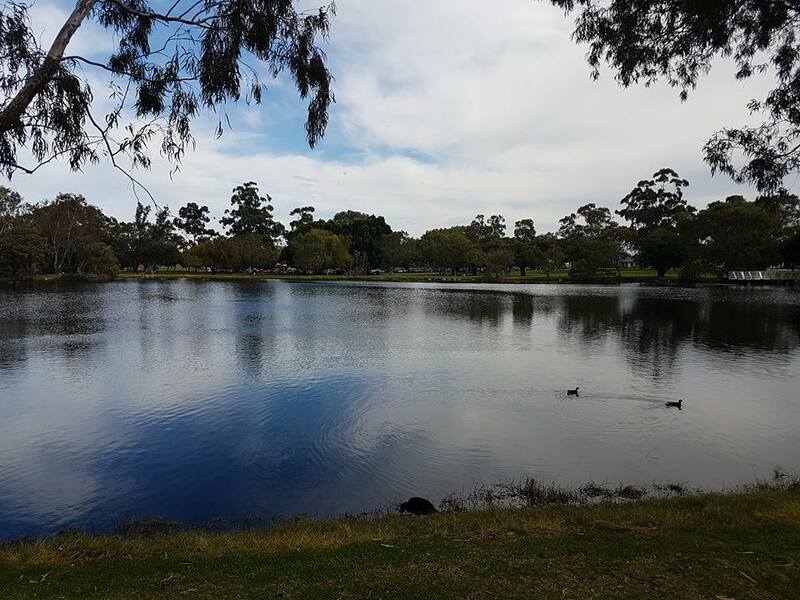 All around the lake walk are bench seats, picnic benches, drink fountains with dog bowls and even other BBQ areas. Tomato Lake really is a great space for all ages. 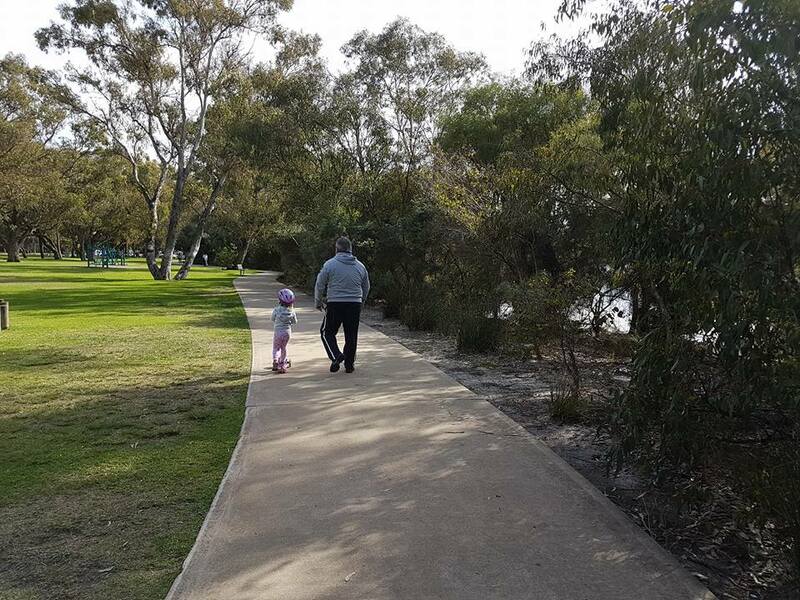 When Miss 3 was a baby We used to meet as a mothers group there and go for a walk round the lake before having a coffee. Miss 3 always enjoys it whether we meet friends or go on our own. It is a popular spot and can get busy on weekends and after school. Also be aware the reserve is not fenced around the road or the lake so it is important you keep an eye on young ones especially if they tend to wander.